Info "Find the odd one out! Then point and laugh!" 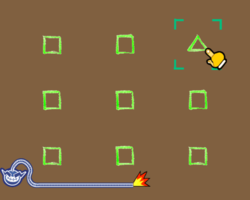 The Outcast is one of Young Cricket’s Microgames in WarioWare: Smooth Moves. There will be nine objects onscreen. The player must find the one that's different from the others. Sometimes the nine figures can be the player's Mii. 1st level difficulty: No hindrances. 2nd level difficulty: Size of things or, rarely, spinning Miis appears. 3rd level difficulty: Clouds or darkness block the player's vision. This page was last edited on October 3, 2018, at 08:56.